Did you know vegetables live in a Kingdom? Or better, a Queendom? Yeah, we Dutch call the white asparagus the queen of the veggies, and she’s the real one to herald Spring. So let’s cook this beauty and call it Spring. 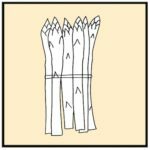 Here’s my guide How to cook White Asparagus. I know I announced Spring already 2 weeks ago (see here), but it was with the ‘wrong’ vegetable. In the Netherlands there is only one vegetable that officially announces Spring for us: white asparagus. It’s the only vegetable we celebrate, with a party opening the season on the second Thursday of April. In every town in the south (where asparagus are mostly grown) they have all kinds of activities celebrating the ‘white gold’. Every restaurant have a special menu with white asparagus. Young ladies are chosen as princesses to be this years ambassador. There even is a museum dedicated to white asparagus! So, yeah, we think they’re special. Despite all of this, a majority of the Dutch don’t eat them, because they’re expensive or because they don’t like them. Who can’t resist love stalks? Yup, that’s how the German “Liebesspitzen” and French “Pointes d’Amour” nick name them. And you don’t need to have a lot of imagination to understand why people consider them an aphrodisiac. But what might have convinced me most, is that it’s one of those rare vegetables that (still) do have a season. And I love that! White asparagus starts somewhere in April, depending on the weather, and it always ends on June 24th. That’s the Day of St John (don’t ask me which John) and all asparagus growers stop cutting the stalks for the plant to recover and rest for the new season next year. So when I saw them at WholeFoods this week, I knew I had to change my dinner plans and I made White asparagus, the traditional Dutch way! 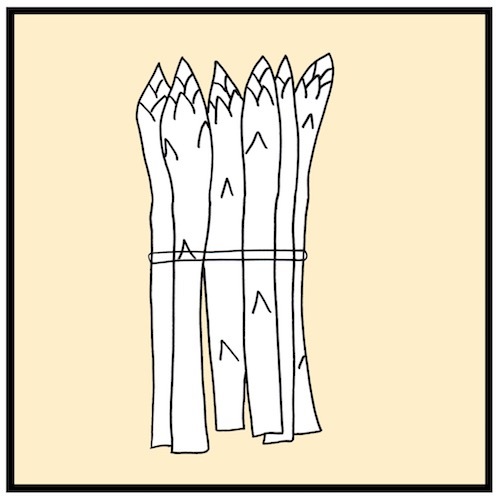 Therefore, below my guide for How to cook White Asparagus. White asparagus are white as they grow under the ground, in contrary to the green ones. This gives them also a totally different flavor and texture. They’re softer, less fiber-y, less ‘green’, and more earthy, but also a slightly bit bitter in taste. The only downside is that you have to peel them. Twice! If you feel any fiber when eating them, you did something wrong. Peel the white asparagus. Grab a stalk at the top between thumb and index finger and let the asparagus rest on the palm of your hand. Use a U-shaped vegetable peeler and start just below your fingers (about 1-1,5 inch from the top). Peel all the way to the end. Turn the asparagus slightly and go round this way. Check if you did a good job, by holding them in the light. Natural light is best. I tend to think that’s the real reason they grow in spring; usually it’s possible to sit outside in the last sun rays while getting them peeled. Needless to say: I love that part! Chop off the end; usually 1/4-1/2 inch should be fine, but do check if you need to cut off more. Cook the asparagus. Use a big pan in which the asparagus can lay flat. Pour water over them till they’re submerged. Bring to a boil, salt the water (some people add sugar) and cook for 4 minutes. Now turn off the heat and let the asparagus sit in the hot water for 10-15 minutes. Boil the potatoes. Peel them, cut them in even sizes, boil them. Hey, this recipe was all about cooking the asparagus, you know how to boil potatoes, don’t you? Cook the eggs. Bring water to a boil. Add a splash of vinegar and the eggs and cook them 8-10 minutes. Drain and shock them under a cold running tab (or an ice-bath), and peel the eggs. Chop them in small cubes. Melt the butter in a small pot on the stove or in your microwave. Serve the cooked asparagus with the potatoes, rolled up ham and finely chopped eggs. Have the melted butter, salt and pepper ready to pour over the asparagus and potatoes.